ON THIS DATE (June 9, 1946) ... A singular honor fell to Joseph A. Boucher, a construction engineer from Albany, at today’s Red Sox-Tigers double-header. The longest home run ever hit by Ted Williams in Boston bounced squarely off his head in the first inning of the second game. 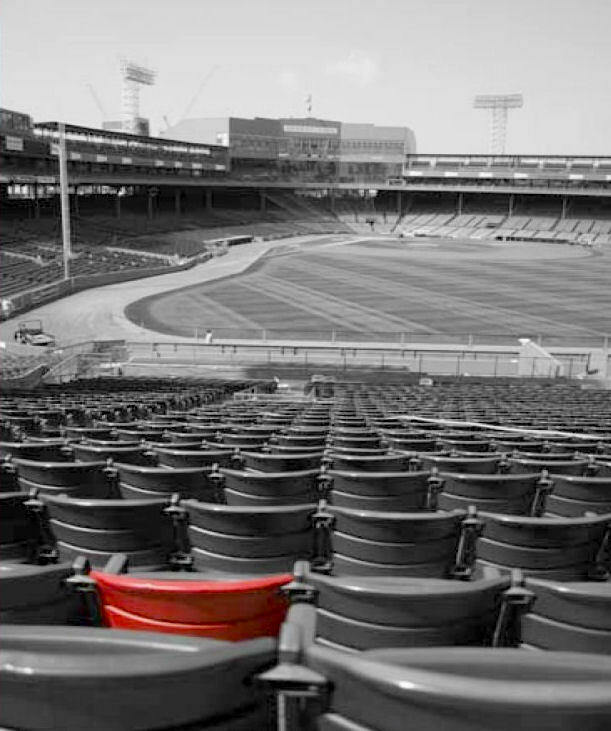 He had never sat in the Fenway Park bleachers before. There were 7,897 fans besides himself perched on the sun-drenched wind-whipped concrete slope. Indeed was the elderly Mr. Boucher honored when crowned by a five-ounce baseball that the game’s greatest hitter had socked some 450 feet. He was sitting in the 33rd row of the bleachers, next to the aisle dividing the first and second sections behind the home bullpen. This was a little more than half way up the slope, and surely out of range of anything less than light artillery, he thought. Asked why he did not defend himself by at least putting up his hands, the engineer replied, “I couldn’t see the ball. Nobody could. The sun was right in our eyes. All we could do was duck. I’m glad I didn’t stand up.” The ball players were not the only ones who had trouble with the wind and sun. The next time the engineer from Albany sits in the bleachers he probably will move to the top row, don sunglasses, and take a glove out of his back pocket as Williams comes to bat. He was not seriously hurt, because he was wearing a straw hat, in the crown of which was a soft label that acted as a cushion. The ball struck the very center of the crown -- a perfect bullseye. It made a tidy little hole that speaks well for the quality of the head piece. Mr. Boucher went to the first-aid room, but after being treated by Dr. Ralph McCarthy and two pretty nurses, he returned to his seat in row 33 and enjoyed the rest of the game. He has yet to recover a ball hit into the stands, although a fan all his life. Needless to say, he has never come any closer than he did yesterday. Ted Williams has hit some tremendous homers at Fenway Park. One off Scarborough last week cleared the 420-foot mark in center field. In his first season he hit the one exit-high into the right field bleachers off Red Ruffing. But yesterday’s drive, borne on a high wind, was his record. Nobody present will forget it, least of all Joseph A. Boucher, who didn’t see it but certainly felt it. Babe Ruth hit more than one ball 3/4 of the way up the right field bleachers at old Fenway Park, but back then the distance was not recorded.